The hatred for Glenn Beck, Sarah Palin, and Americans that don't agree with the current direction of this nation was dripping from Chris Matthews' lips Friday evening. In a show filled with falsehoods and anti-Conservative rants that should even embarrass folks at MSNBC, the "Hardball" host concluded by once again attacking one of the most popular radio and television personalities in the country along with the former governor of Alaska. Of the "Restoring Honor" rally to be held in Washington, D.C., Saturday, Matthews asked, "Can we imagine if [Martin Luther] King were physically here tomorrow, today, were he to reappear tomorrow on the very steps of the Lincoln Memorial?" The MSNBCer disgustingly answered his own question, "I have a nightmare that one day a right-wing talk show host will come to this spot, his people`s lips dripping with the words 'interposition' and 'nullification.'" 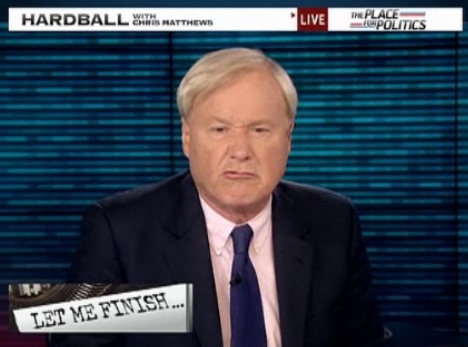 CHRIS MATTHEWS, HOST: Let me finish tonight with those few lines from the Martin Luther King speech of 1963. MARTIN LUTHER KING, JR., CIVIL RIGHTS ICON: But not only that, let freedom ring from Stone Mountain of Georgia! Let freedom ring from Lookout Mountain of Tennessee! MATTHEWS: Dr. King was talking about the founding place of the KKK, Stone Mountain. The site of the Scottsboro Boys trial -- Lookout Mountain. This was 1963, never forget. The civil rights bill was a year away. Lunch counters and gas station restrooms were still for whites only, so were hotels and restaurants throughout the South. I remember myself seeing those white-only signs along the highway heading south during a spring break. I remember seeing one still there when I went to rural Louisiana to train for the Peace Corps. There was a hard divide in this country back then. On one side stood the people who believed in the power of the federal government to do the right thing, especially when state governments, local governments and local businesses persisted in doing the wrong thing or doing nothing. It was the time when governors like Ross Barnett of Mississippi and George Wallace of Alabama stood up to keep their universities white only. A time when people used terms like "nullification" and "interposition," who claimed the right to obstruct the federal government, to act even when Congress passed a law. Today, we hear the echoes of those voices, people calling for nullification. Even secession gets a call from those who just don`t like the federal government and certainly don`t like the man leading it. Tomorrow, those who thrill to such words are heading here to Washington. They`re heading directly to the Lincoln Memorial, site of the Martin Luther King speech. The main speaker is the man who said this about this country`s first African-American president. GLENN BECK, FOX NEWS HOST: This guy is, I believe, a racist. Look at the way -- look at -- look at the things that he has been surrounded by. MATTHEWS: That is the man who comes to Lincoln`s feet to claim the mantle of Martin Luther King. Can we imagine if King were physically here tomorrow, today, were he to reappear tomorrow on the very steps of the Lincoln Memorial? I have a nightmare that one day a right wing talk show host will come to this spot, his people`s lips dripping with the words "interposition" and "nullification." Little right wing boys and little right wing girls joining hands and singing their praise for Glenn Beck and Sarah Palin. I have a nightmare. Many talked today about a religious center near Ground Zero being a desecration. What do you call this? Actually, the real desecration is what Matthews and his co-conspirators at MSNBC are doing to journalism. Offering opinions about political figures and competitors on rival networks is one thing, but this constant invective aimed at Republicans and Fox News personalities coming from Matthews and virtually all the on air talent at MSNBC is getting totally out of control. What Matthews did Friday evening isn't much different than what NewsBusters reported is now regularly being spewed by liberal radio talk show hosts. Does MSNBC really want its programming to be at the same level as the hatred being uttered by the likes of Mike Malloy, Stephanie Miller, Randi Rhodes, Ron Reagan, Jr., and Montel Williams? As Ed Schultz is now a part of MSNBC's prime time lineup, and is a regular emitter of some of the most vile rhetoric on the radio today, maybe the answer is "Yes." Journalism be damned, I guess.